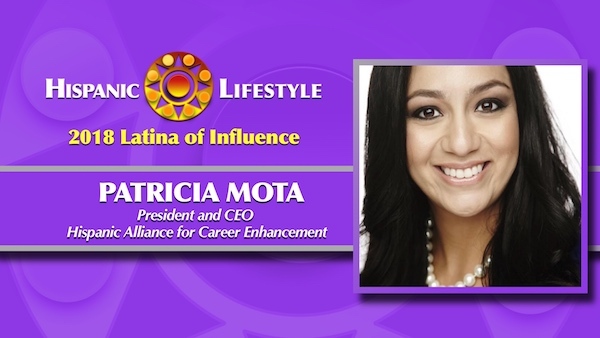 Hispanic Lifestyle is pleased to recognize Non-Profit Executive and Community Leader Patricia Mota as a 2018 Latina of Influence. Ms. Mota along with our entire list of 2018 Latinas of Influence are invited to participate in Hispanic Lifestyle’s 2018 Latina Conference taking place April 4 and 5, 2018 in Ontario, California. Patricia Mota is President and CEO Hispanic Alliance for Career Enhancement (HACE) a national non-profit dedicated to the employment, development, and advancement of current and aspiring Latino professionals. Patricia is responsible for leading strategy, fundraising & development, professional and student leadership programs, and expanding organizational reach on a national scale. Having experienced the education and career-opportunity gaps that exist first-hand was eye-opening and shocking for Patricia Mota, as a high school student, and then as a first-time professional. Since then, she has made it her personal mission to close these gaps. Patricia is a passionate, innovative trailblazer, dedicated to the advancement and empowerment of Latinos across various stages in their education and career. With over 10 years of demonstrated success in leading this personal mission via building effective programs and strategic partnerships, Patricia works to strengthen and expand the Hispanic Alliance for Career Enhancement’s (HACE) mission, brand, and impact across the country.Patricia strives to engage experienced professionals as mentors and advisors to create a multi-generational network to support Latinos’ career growth around the country.